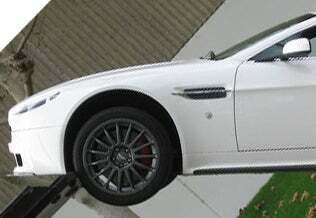 The Carpocalypse is forcing many people to unload unnecessary luxury items, but the guys loading this Aston Martin had the absolute wrong idea of how to go about doing it. See the damage below. We're pretty sure we know what went wrong here as evidenced by the nice loading ramp tray laying on the ground, but after seeing this, we believe that we've got a perfect candidate for a crack pipe. 2008 Aston Martin V8 Vantage, shortened to aid weight distribution and handling. Cheap!